The account proclaims that the operators will only give up the handle if the series is brought back. The likelihood of this happening is slim and it doesn’t seem that Group Nine Media, the new owner of the Seeker brand, is interested. 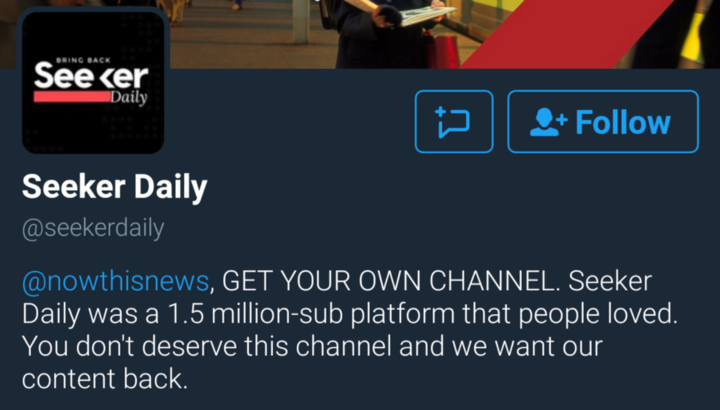 NowThis also controversially took over SourceFedNerd, another former Discovery property. Dubbing it NowThis Nerd, fans of SFN left en masse and those who have stayed have complained that the channel isn’t being updated. Fans of SFN have similarly registered the @nowthisnerd Twitter handle to prevent NowThis from registering it. It looks like Group Nine, a joint-venture that Discovery could buyout if it does well, is off to a good start — but not in the way they would’ve hoped.